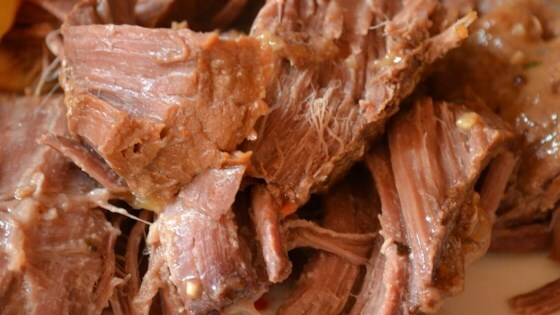 "I make this meal quite often it is so simple and so quick and always comes out perfect, if you love tender roast you must try this!" In a small cup or bowl, mix together the Italian salad dressing mix, Ranch dressing mix, and gravy mix. Sprinkle them evenly over the roast. Pour in the beef broth and add the chopped onion. Seal and lock pressure cooker, and cook over high heat to build pressure until the indicator sounds (mine whistles). Turn heat down to medium, and cook for 45 minutes. Remove from heat and let stand for 5 minutes. Run under cold water to help release the pressure before unsealing the lid. You can use the juices as an au jus, or thicken with flour or cornstarch to make a yummy gravy. My family and I loved this! The meat was sooo moist. Next time will adjust the seasonings, because it was a little too salty, but still excellent!